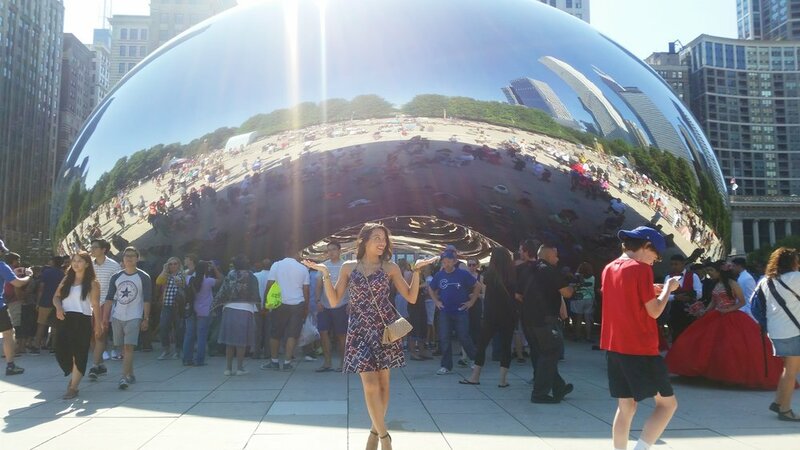 In honor of #ThrowbackThursday I decided to share a recap of my trip to Chicago. This post is long overdue but that’s a story for another day. My trip to Chicago was a spur of the moment week-long trip. My grandmother reached out and said it would be great to spend a few days with me and the rest of the family while she was visiting. I wasn’t too sure about going, but last minute I decided getting out of New York City for a few days wouldn’t be a bad idea. I literally bought my flight two days before I was actually supposed to leave! Yeah, I know, what was I thinking? I’m so glad I did because it was a much-needed trip and I had the best time in the Windy City. My family lives in the suburbs which was about 40 minutes away from downtown Chicago. However, I was only in the suburbs for a few hours a day because we would spend our whole day sightseeing. This wasn’t my first time in Chicago either, I went when I was much younger but I don’t remember much of it. So let’s just say this was my first trip to Chi-town and I documented every part of it. From the hidden gems to grab a bite to eat to the touristy spots that are a must-see. 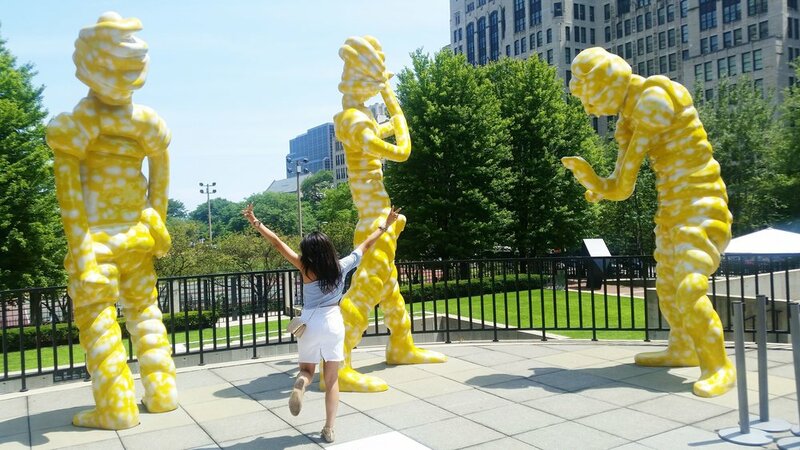 First stop: I had to visit Millennium Park, it was on the top of my list! The park is absolutely stunning because it’s filled with so much architecture and history. We sat on the grass at the Jay Pritzker Pavillion where they usually have free concerts and weekly movies. Unfortunately, I wasn’t able to catch either but I did I enjoy just laying on the grass and looking up at the crisscrossing steel pipes. From there we walked over to the main attraction, Cloud Gate also known as the “Bean.” We went on a Saturday afternoon, so you can already imagine the crowds. What I loved the most was was that you could see the Chicago skyline on the reflection, especially at night. We went back to the Bean a few days later during the week and it wasn’t as crowded. I definitely recommend going during the week in the late afternoon, so you can get a few good pictures. 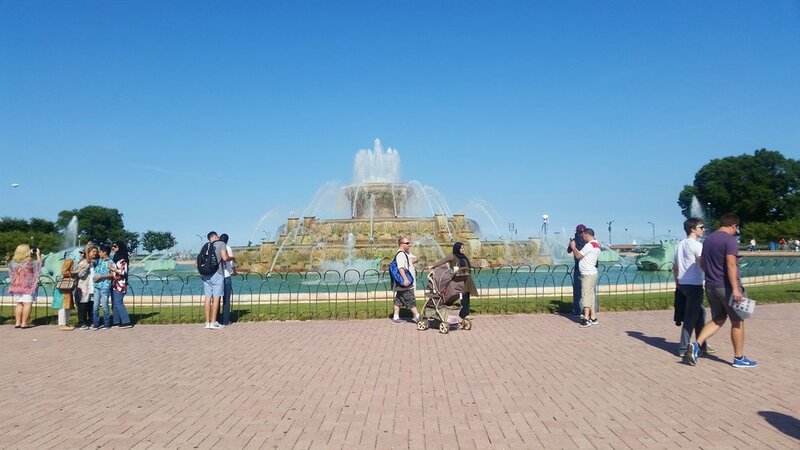 The photos below was taken at the Buckingham Fountain at Grant Park. This was the perfect spot for pictures because it wasn’t crowded at all. Did you know that the Buckingham Fountain is one of the world’s largest fountains? I had no idea! The next time you’re in Chicago stop by in the evening to be able to see the lights and water show. Every time I travel to a new city I absolutely love visiting the museums. It’s one of my favorite things to do. This time around it was a must on my list because my little brother has never ever visited a museum! As his big sister I had to show him what he was missing out on, so we visited the Museum of Contemporary Art Chicago. We saw the Kerry James Marshell: Mastry exhibit which portrayed African American history and his paintings over the last 35 years. If you’re going to be in Chicago this month definitely check out his work at MCA. The exhibit will be on display until September 25. Another exhibit that was really interesting was Witness. Witness is an LED installation by Alfredo Jaar (see below) and when you walk around the installation you can go inside to watch a video. The video is more documentary style on the life of photojournalist Kevin Carter and his Pulitzer Prize winning image of a little girl starving to death with a vulture only few steps away. Carter was on assignment in Sudan covering the Sudanese famine. This exhibit will be on display until February 2017. I’m not going to get into too much detail on the exhibits at MCA or Kevin Carter’s career but definitely check out the museum if you’re in town. Below are some of the images I took. My brother and I stopped for breakfast at Sunny Side Up & Coffee Shop. I had the pancakes with strawberries on top and my brother had the bacon pancakes, both were so yummy! This little restaurant was in close proximity of the museum and the shopping district, so it was the perfect spot to stop in for coffee or lunch too. While I was in Chicago I met one of my really good friends and former colleague from Glam Belleza Latina, Lyndsay Green. We had lunch at Hamburger Mary’s. I definitely have to thank her for finding this restaurant, I had one of the tastiest burger and fries. It’s also a really cute burger joint that hosts drag shows and trivia nights. At the end of your meal when you ask for the check, it comes in a high-heeled shoe. Since I was in Chi-town, you know I had to try the pizza! Chicago is known for their deep dish pizza and being that I'm a pizza fanatic I had to see what all the hype was about. One night my family and I ventured out to Giordano's aka "Chicago's Famous Stuffed Deep Dish Pizza" restaurant. They have locations all over Chicago so it was easy to get to. We ordered the cheese deep dish pizza and honestly, I was really disappointed. The pizza was good but I was just expecting more. It was very filling and I only managed to eat one slice. It's just a lot of sauce (too much for me personally), thick bread and not enough cheese. I'll much rather stick to my NYC slices, even the 99 cent pizzas are worth the calories. A visit to Chi-city isn't complete without heading up to The Skydeck on the 103rd floor of the Willis Tower. My brother and I decided to check out the views on The Ledge which is 1,353 feet up. Here's a tip, go during the week! There were no lines at all and it wasn't crowded. Yes, this is a tourist trap but it's really a great experience. You get to see all of Chicago through the glass balcony. They have interactive exhibits for the kids and when I was there they were celebrating 30 years of my favorite movie, "Ferris Bueller's Day Off." I would also recommend going to the Navy Pier it's like the South Street Seaport of Chicago but better. They have a variety of shops, restaurants, rides, the Centennial Wheel and stunning views of the shoreline of Lake Michigan. Last but not least before my flight back home, I visited my aunt's store, Pyramids at the North Riverside Mall. They have a variety of Egyptian items, art pieces, jewelry, souvenirs and much more at affordable prices. If you know me, I always wear a Hamsa necklace or my evil eye bracelets to ward off negative energy. They sell a variety of pieces at the store, check them out if you're in town and tell them I sent you. That’s a wrap of my trip to Chicago. I wish I would have stayed longer to see all the city has to offer but maybe next time. Have you visited the Windy City? If so, tell me in the comments what were some of your favorite spots. Thanks for reading, I know this was a long one!